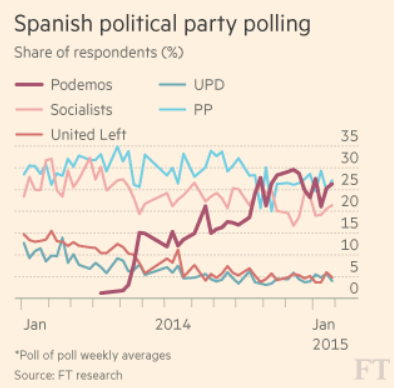 Not only does Germany and the Troika have its hands full with Greece, Podemos Cements Position in Spanish Polls. Spanish voters are shifting their support towards Podemos in growing numbers, according to a poll that provides fresh encouragement to the far-left anti-establishment party as it prepares for a series of tricky electoral contests over the next few months. The poll showed that Podemos would win 24 per cent of the vote nationwide, making it the second-biggest group behind the ruling Popular party of Mariano Rajoy, prime minister. The figures showed a rise from 22.5 per cent in October and 15.3 per cent in July last year. Released by the CIS research centre on Wednesday, the poll offers the first barometer of Spanish public opinion since the January Greek elections, which saw the triumph of the far-left Syriza party, a close ally of Podemos. Podemos has already sought to capitalise on the triumph of its Greek partner, holding a mass rally in Madrid last Saturday that attracted more than 100,000 supporters. The survey also offered an important pointer ahead of next month’s election in Andalucia, the most populous region in Spain and a traditional bastion of the centre-left Spanish Socialist Workers’ party (PSOE). The CIS poll found that Podemos was now the only main party whose support was still rising — suggesting that the new movement had yet to hit its electoral ceiling. The PSOE, still the main opposition force, fell back to third place. In spite of the alleged recovery in Spain voters are disastified. Why? Unemployment is still near 24% and youth unemployment is still over 50%. Recall that Podemos "Economic Manifesto" Calls for Debt Restructuring, Spain to Abandon the "Euro Trap". "Spaniards should be aware that it is physically impossible that they can pursue policies that meet the national interest, within the euro as it is designed. The euro was conceived as a real trap, but nowhere is it written that people have to accept it ." said Iglesias. Also consider Incredible Populist Positions in Podemos' "Economic Manifesto".